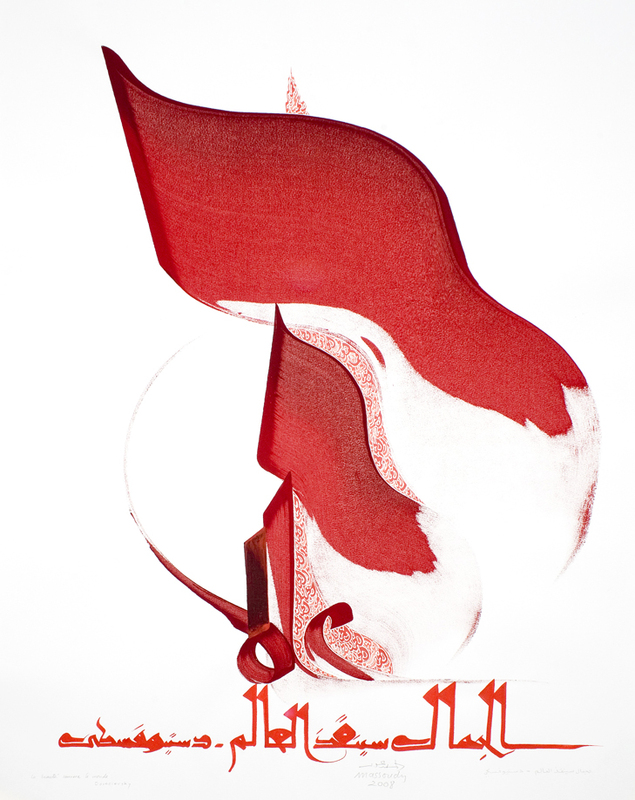 Hassan Massoudy trained as a classical calligrapher in Baghdad before attending the Ecole des Beaux-Arts in Paris in 1969. The prevailing themes of his work are peace and tolerance. Working also in performance, Massoudy has taken his work beyond calligraphy to grapple with landscape, architecture, human emotions and experience. Moving beyond the repetitious nature of calligraphy, Massoudy has invented his own adapting language that refers to traditions of both painting and calligraphic writing. The turning point came when he envisioned Arabic letters as sculptures in the desert outside of Najaf. Massoudy’s work is thus a melding of the Arabic and European tradition situated in the liminal space between abstraction and figuration.